Today I thought I'd go back in time and pull out a dessert that was really popular when peace signs were everywhere, skirts got shorter, colors were worn in ways you wouldn't dare to wear them now, and spectacles were pointed on the sides. Okay, this was before my time, but even my parents shared enough of the 'flavor' of their era for me to appreciate it a little. So, I'm going back to the Ambrosia Salad. Now, this salad really makes me think that people just decided to mix a bunch of stuff together and call it dessert. If you're not familiar with it, it's Cool Whip, coconut, canned fruit, and maybe some nuts all mixed up, sometimes with chunks of jello, and you just serve it up in a bowl. Who started that? I'm not sure, but I've seen it as early as colonial times, yet I've also heard it referred to as ghetto dessert. I mean, how do you get from colonial finesse to ghetto dessert? 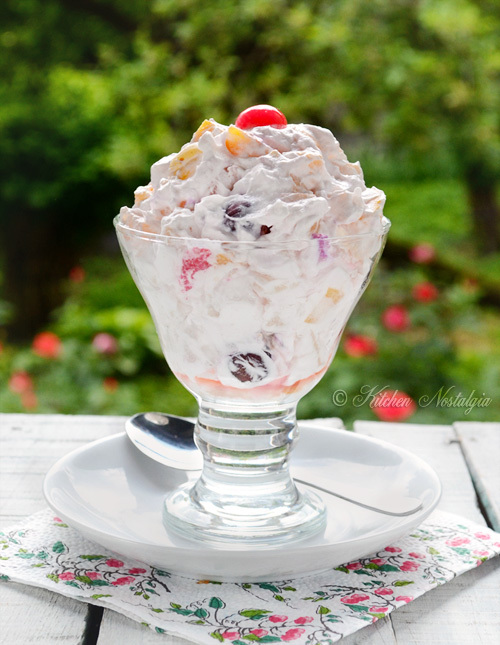 I guess the mixture of ingredients may write it as 'ghetto', but if you're too good for ghetto Ambrosia salad, grab yourself some fresh fruit, skip the jello, and bourgeoisie it up a bit! I can tell you that I'm gonna whip some up this weekend for my tribe. This classic dessert is just what I need when I'm looking for something easy, and uh, I'm not too good to try goulash dessert. Besides, I have a family of 12 to feed. I mean, although we like to challenge ourselves in the dessert department, we could stand to appreciate something easy to throw together every once in awhile. Now tell me that doesn't look tasty? Creamy cool whip loaded with fruit, it's even more appetizing when you put some effort into its presentation. So what do you say? Ambrosia salad anyone?